In the rotated factor matrix of Table 19.3, factor 1 has high coefficients for variables VI (prevention of cavities) and V3 (strong gums), and a negative coefficient for Vs (prevention of tooth decay is not important). Therefore, this factor may be labeled a health benefit factor. Note that a negative coefficient for a negative variable (Vs) leads to a positive interpretation that prevention of tooth decay is important. Factor 2 is highly related with variables V2 (shiny teeth), V4 (fresh breath), and V6 (attractive teeth). Thus, factor 2 may be labeled a social benefit factor. A plot of the factor loadings, given in Figure 19.6, confirms this interpretation. Variables VI’ V3, and Vs are at the ends of the horizontal axis (factor 1), with Vs at the end opposite to VJ and V3, whereas variables V2, V4, and V6 are at the end of the vertical axis (factor 2). One could summarize the data by stating that consumers appear to seek two major kinds of benefits from a toothpaste: health benefits and social benefits. These symbols were defined earlier. The weights, or factor score coefficients, used to combine the standardized variables are obtained from the factor score coefficient matrix. Most computer programs allow you to request factor scores. 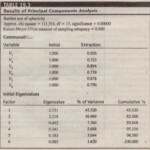 Only in the case of principal components analysis is it possible to compute exact factor scores. Moreover, in principal component analysis, these scores are uncorrelated. In common factor analysis, estimates of these scores are obtained, and there is no guarantee that the factors will be uncorrelated with each other. 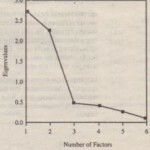 The factor scores can be used instead of the original variables in subsequent multivariate analysis. 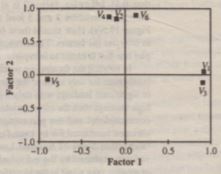 For example, using the “Factor Score Coefficient Matrix” in Table 19.3, one could compute two-factor scores for each respondent. The standardized variable values would be multiplied by the corresponding factor score coefficients to obtain the factor scores. Sometimes, instead of computing factor scores, the researcher wishes to select surrogate variables. 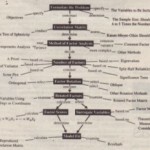 Selection of substitute or surrogate variables involves singling out some of the original variables for use in subsequent analysis. This allows the researcher to conduct subsequent analysis and interpret the results in terms of original variables rather than factor scores. 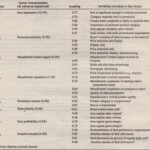 By examining the factor matrix, one could select for each factor the variable with the highest loading on that factor. That variable could then be used as a surrogate variable for the associated factor. This process works well if one-factor loading for a variable is clearly higher than all other factor loadings. However, the choice is not as easy if two or more variables have similarly high loadings. In such a case, the choice between these variables should be based on theoretical and measurement considerations. For example, theory may suggest that a variable with a slightly lower loading is more imI, X1 really than one with a slightly higher loading. Likewise, if a variable has a slightly lower loading but has been measured more precisely, it should be selected as the surrogate variable. In Table 19.3, the variables VI’ V3, and Vs all have high loadings on factor I, and all are fairly close in magnitude, although VI has relatively the highest loading and would therefore be a likely candidate, However, if prior knowledge suggests that prevention of tooth decay is a very important benefit, Vs would be selected as the surrogate for factor I, Also, the choice of a surrogate for factor 2 is not straight forward. Variables V2, V4, and V6all have comparable high loadings on this factor. If prior knowledge suggests that attractive teeth is the most important social benefit sought from a toothpaste, the researcher would select V6.